We all want a good traffic, less bounce and a huge sales rate in our business. Thankfully this is all possible and social proofing is one of the way you can achieve this. Social proofing is already available with different plugins in Wordpress, therefore to take Joomla one step ahead and help grow your business we released NotiFly - The First Ever Social Proofing Extension for Joomla. We got lot of good reviews and applauds from you. As you know we try our heart and soul to serve you better, we are trying our best for NotiFly also. In this v1.3 of NotiFly we have added support for your favorite Joomla cart extension - J2Store. We know running an ecommerce site is a very tough task, the owner have to follow many strategies to improve the sales. One of the most effective strategy is to showing social proof to user as notification. NotiFly's J2Store integration shows notification regarding your sales on your ecommerce site. You do not need a big budget to advertise or do a lot of complex settings. Now whenever a person purchase a product from your ecommerce site, other will get notified with help of NotiFly. We often like to pick the trendy and popular product. We are human and our brain works in this way. So while a person likes a product of your and get ready to buy it, he holds back because he lacks confidence. This is where Notifly can help your user to bolster his decision for buying your product. To make you understand better look at some of these real life social proof examples that you might encounter on a daily basis. Shopping Malls: People gather crowd in a shopping mall where products are good. But how do they judge it? It is not possible to check each and every product by yourself . What people do is, when they get interested they look here and there and try to get recommendation, reviews or something that will bolster their trust. They get confidence when they see other people are buying products from this shop, which enhances their trust and generate more sales to you. Restaurant: We can see that restaurant has very limited number of seats. Therefore people who are waiting for a table has to forcefully wait outside. This shows the high demand of the restaurant to outsiders. As a result, passersby will be more interested to visit the restaurant in the future. When he sees the activity of other peoples, it helps him to increase confidence inside him. And therefore finally he gets 100% determined to buy your product. In eCommerce, J2store is the most popular extension for Joomla. You can easily create and manage your online store with help of J2Store extension. Add as much product you want on your store. Online product selling was never been so fast and easy. Use articles as products, make product variants, add advanced product pricing by customer group or quantity and do more with J2Store. If you use J2Store on your site, you can enhance your sales and power of J2Store with NotiFly. Whenever one of your digital product is sold, the event will be shown as a notification to a visitor. Assume one of products from your site is sold. So when a product is sold a notification will be sent to all of the current visitor in that time. If ten product is sold, ten notification will be sent to current visitors. That's not all. According to your settings this notifications will be sent to every visitor, it doesn't matter when they visit your site. If they visit your site they are guaranteed to get influenced by the notification from NotiFly. This notification will work as social proof and sales of your J2Store site will be increased. There are alot of sites which use social proofing plugins like Proof, Fomo on their WordPress Sites. The site owners who used these plugins got conversations increased, sales increased. Now let's check out some case studies of social proofing service. This is a sock subscription service which mails its customers one pair of funky patterned socks made of bamboo every month. The owner of this site used Fomo social proofing tool trial for 7 days. The moment he tried it, the conversion increased instantly. Within the trial period, conversation rate increased from 2.4% to 4%. GetSocked.com.au is happy by using social proof. Drip is a popular email marketing delivery service, that goes beyond. After using the social proofing service the bounce rate decreased from 60% to 50% and engagement rate was also high. The Social proofing tool helped Drip rank higher on Google. Because of social proofing they had some good months, including $20,000 in yearly recurring services. 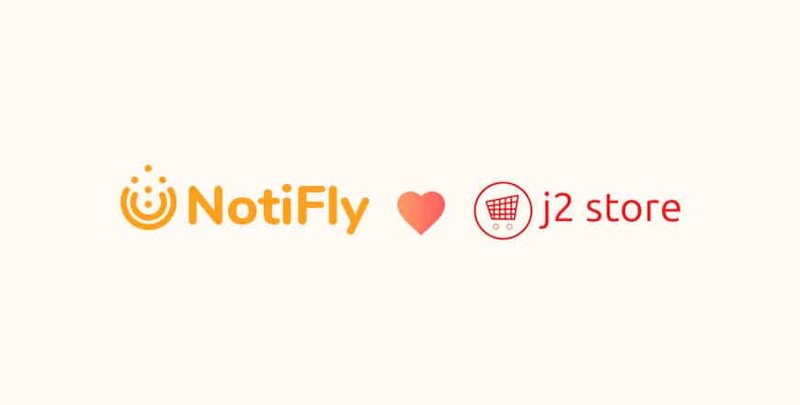 If your eCommerce site consisting of J2Store plugin just go to Integrations after installing NotiFly. At here you will find the J2Store, enable it and click on configure. We have kept all settings simple, so you work easily with NotiFly. After clicking on configure, you will find only two options - Status and purchase. Status is for enabling or disabling the integration, keep it disabled if you are not using the integration. When you turn on the "enable purchase," notification will be turned on for any product that is sold via your J2store integration. You can change the notification title and message from there. After altering the settings do not forget to click on the save button or else no changes will be made. After enabling J2Store integration, a template for J2Store purchase is automatically generated in the templates section. From there you will be able to edit or customize the way you like. Start changing your traffic on your Joomla site with NotiFly. Soon we will also integrate your favorite social extension EasySocial with NotiFly. Till then stay tuned and do not forget to give your valuable feedback. Your feedbacks inspire us a lot. If you need to know anything you can contact our support or post a comment below.